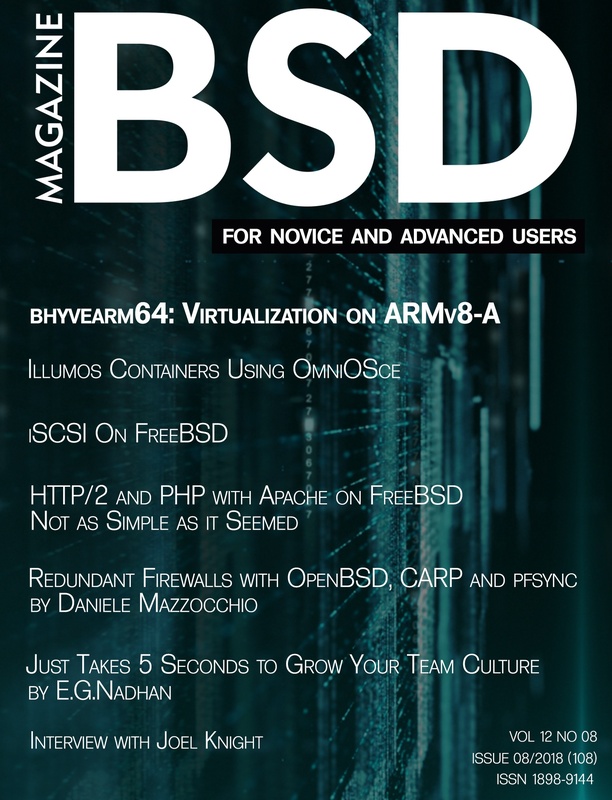 This BSD Magazine issue features an article about Illumos containers and OmniOSce, bhyve virtualization on ARMv8-A, iSCSI on FreeBSD, HTTP/2 & PSP with Apache on FreeBSD, Redundant Firewalls with OpenBSD, an interview with Joel Knight about OpenBSD, as well as another column by Rob Somerville. You may download the PDF/EPUB here or at the link below. Note that a user account is required to obtain the magazine issue. Summer is here! A season which appeals to affection and sentiments, and of course, vacation time isn’t complete without a touch of laziness. As Ella sang: ‘Summertime, and the livin’ is easy’, it’s indeed a good time. I hope you will work on unfinished projects, explore the latest technologies, and encounter numerous exciting tasks. Here, we concertedly continue to publish great lectures for you and take pride in them as well. Therefore, as you’ll be enjoying a sunset view on your porch, have a quick read at our BSD Magazine issue to crown the special day. Now, let’s have a glimpse of what our experts prepared for you.